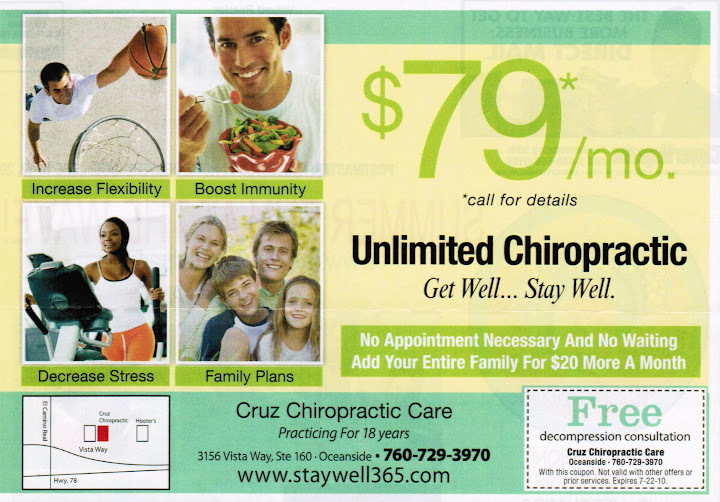 Unlimited Chiropractic • Get Well . . . Stay Well! WHY DO I NEED UNLIMITED CHIROPRACTIC? Chiropractic is NOT just for pain . . . Our members enjoy the benefits of a spine that is aligned regularly which helps tremendously: Improves sleep, relaxes muscles, improves posture, increases flexibility, decreases stress and tension, strengthens immune system, helps relieve pain and headaches and helps to slow spinal degeneration to name a few!! o	No appointments necessary . . . No Waiting!! The mission of Cruz Chiropractic Care is to provide the members of our community with high quality, affordable health care in a comfortable and caring environment. We are committed to providing family chiropractic care of the highest quality. We honor the innate healing capabilities of every patient regardless of their condition or symptoms with which they present. Our intent is to change the perception of chiropractic as a pain relief/crisis care treatment to the reality of it being a science, philosophy and art by which interference to our true genetic health potential is removed. Our goal is to educate the community at large and serve as a beacon of health-oriented knowledge. Our mission is based on an understanding that health is more than the absence of disease and the human body is more than just the sum of its parts. At Cruz Chiropractic Care, we are deeply committed to removing the obstacles that you may encounter through life that prevents you from achieving your highest potential for health and well-being. We are committed to working on a preventive basis for the long-term benefit of your health. This is a new and innovative Chiropractic practice model that requires NO APPOINTMENTS, NO WAITING AND IS AFFORDABLE FOR ANYONE. Disclaimer: This program is not an insurance plan or insurance replacement nor an offer of chiropractic insurance of any sort.